The Toolpost, although not inexpensive, are a fraction of the price of the industrial versions and may well introduce a wider audience to the joys of using them. The wheel sent - constructed of metal - was 19mm (3/4in) wide. 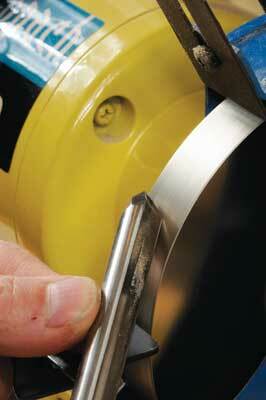 It was well made, finely crafted, finely machined and the curved sharpening face was fully coated with CBN. In addition to this, CBN is also present on the side, for about 20mm (3/4in) or so in from the edge. Since the CBN is bonded to a metal wheel there is no risk of the wheel breaking, which gives you the option of sharpening on the side of the wheel as well. I fitted it to a standard speed grinder, and away I went with sharpening a large collection of carbon and HSS tools, both freehand and with jigs. 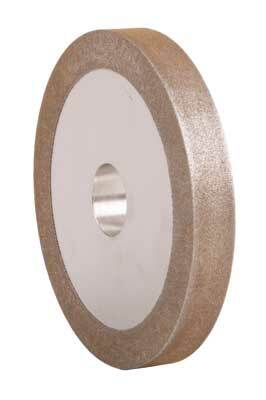 The first thing to note is that the CBN wheel cuts very quickly so only the slightest pressure on the blade is needed, and there are almost no sparks during the sharpening process. The grind off the wheel is very fine indeed; the resultant micro striations along the bevel are equivalent to a very fine, standard Alox wheel. But interestingly, as mentioned, the sharpening is fast so be careful not to grind away too much blade when you sharpen the tool. I also found that the blade did not heat up as quickly or as much when compared to a conventional Alox wheel, and the wheel did not clog up even after heavy useage. The cutting edge off the tool is superbly sharp and very fine indeed. The grinding wheel performed superbly - it is a real stunner. I could not fault the sharpening on the wheel, the resulting finish on the bevel or the edge it produced. The initial cost of buying such a wheel is high, but since the cutting face will never deform from its manufactured shape, along with being able to use the sides of the wheel and 0 as with its industrial cousins - has a superb cutting surface lifespan, I think it represents very good value for money. They are certainly worth looking at. I found the wheel easy to fit and simple to use. I agree that they cut very fast and this takes a little getting used to. I also found that a lot less heat was generated during sharpening. The sides are great for sharpening skew chisels. Very nice.